At first glance, pergola designs would seem to be rather straightforward and simple. This is likely due to how the structure of a pergola is generally laid bare to the eye, and the fact that there are only a few structural components that have a lot of replication of the same forms. This aesthetic simplicity shouldn’t be confused with the complexity that goes into designing and building a pergola. With a pergola, every structural component has to not only be strong, but also beautiful at the same time. This means that planning and quality workmanship are of utmost importance. You can’t simply cover up mistakes with a shell like you can with most other structures. The open nature of the structure means that the joints have to be more precise because they are eminently viewable of course. But also because they have to bear more of the stresses than they would in other types of buildings. With most structures the strength of the joints of structural components can be further braced with a stiff and inflexible shell. The plywood that is put on the side of a house for instance. This helps stiffing up the framing quite a lot. With a pergola though, there is little you can do to help support the structure in this manner. The posts, beams, and slats all have to be fixed just with the joints between them in most cases. 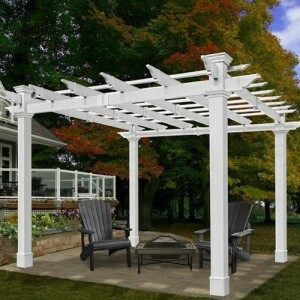 There are some additional structural components that can be added to help firm up the pergola. Often they work contrary to the purpose of the structure, which is to keep everything as open as possible. In some cases though an arbor or trellis built into the site of the pergola can help to stabilize the structure. But even then you should never rely on that method. As stated previously, every component in the pergola’s structure is going to have an aesthetic impact. You can see every joint, every beam, every slat. Not only is this openness showing your work off whether you like it or not, but the regularity of the design is going to highlight any irregularities. A warped board is going to create a dissonance in the pattern of slats for instance. Being slightly off-square is going to be readily visible. While there are a lot of intersections and lines at work, our minds are very good at spotting irregularities in patterns, and indeed it draws our attention. For these reasons, a pergola is perhaps the structure where precision and planning is most imperative. Certainly it is when dealing with common garden structures. Normally when you are building an outdoor structure, much of the framing can be done with less expensive materials. This is because while they need to be strong, they don’t have to be as beautiful as the exterior components. With a pergola, they all are exterior components though, so the entire structure needs to be made from strong and beautiful materials. When going for smooth straight lines and regular patterns, a material that is very precise in it’s dimensions can be a great asset. This is why many modern pergolas are built using metal or other man-made materials. The manufacturing process which creates the structural components in these pergolas results in a very regular and precise pattern formed by the lattice. At least it does with high quality manufactured components. Sometimes quality isn’t up to par though. Aluminum is one of the more prevalent choices in this regard. Lightweight and strong, as well as being near immune to the effects of sun, rain, or insects, an aluminum pergola can be a wonderful open structure that will last for decades. Vinyl is another choice that is becoming more and more popular for much the same reasons. Still, the old standby wood may yet be the best material to go with. It certainly is the most common one. Wooden pergolas are a natural choice, due to how well they fit into the landscaping. The grain of many types of wood is very beautiful, especially once sealed or varnished. The flowing and irregular patterns in the wood can help to camouflage slight irregularities in the shape or placement of the wood structural components as well. Some types of wood are better than others at this due to the quality and prominence of their grain. The finish and how they were cut will also matter quite a lot. Timbers which are left unfinished have a great look all their own, but it definitely makes the grain less prominent. Using a wood with prominent grain and then putting on a varnish or stain can really highlight the beauty of the wood. When we hear about “environmental concerns”, it’s natural to think about the impact on the environment. However, there are impacts of the environment on our choices as well. Both are important. Wood may seem like a wonderful material to use. It’s renewable, natural, and the trees it comes from help tie up excess carbon from the atmosphere. However, harvesting the wood can be done in ways that isn’t as environmentally friendly. In some cases this can mean the wood is not as safe for the environment as we’d suspect. Generally though, it’s better than other man-made materials in this regard. Perhaps a more pressing concern when dealing with outdoor wooden structures is not how the environment has been impacted by the harvesting of the wood, but how well the wood will stand up to the environmental pressures that being exposed to the elements will place on it. There’s nothing that can be done about how the wood was harvested, but you can help protect the wood from the elements. Doing so is actually helping to protect the environment at the same time. By keeping your wooden pergola in good condition, you are ensuring that it doesn’t have to be repaired or replaced. Otherwise you might find that you have to go order more wood, which means more logging. Protecting the wood in your pergola is an important concept all-around. The choice of wood also has a big impact here. Pine is cheap and easy to come buy, but is also not very well suited for building exposed structures. Redwood on the other hand has natural resistances against water damage such as rot, and also from damage from termites. Using a wood such as redwood thus can be a better choice. The more interesting coloration of redwood may also be a plus on it’s side. Cedar is another wood that performs well in outdoor applications. It is more expensive than pine or redwood, but also tends to be more visually appealing. For these reasons, it’s often the material of choice for pergolas when the budget will allow for it. One of the more important factors to take into account when choosing a pergola design is how it will impact the overall look and utility of your yard. A beautiful pergola on it’s own may always be a plus, but in some cases it could interfere with the view or foot traffic through the yard. To ensure you get the most out of your investment as possible, it’s a good idea to pick a design that will fit into the rest of the landscaping rather than disregard it. One of the most important things to consider in this regard is how the pergola will attract the eye and foot traffic. People will naturally be drawn to the pergola, either to look at it, or to enjoy sitting under it. This attractiveness can be very useful in helping to shape the rest of the yard. By placing the pergola where it can be viewed easily from other structures, as well as having a good view itself, you can maximize the aesthetic value it brings to your yard. Similarly, by placing it so it is readily accessible from your walkways you can make it a focal point for gatherings in your yard. Pergolas make great trellises or arbors for climbing vines. By carefully planning your pergola’s design and placement, you can help to facilitate it’s use as an arbor. This might mean placing the pergola near your garden, or including places to hang pots from the pergola’s deck. The additional shade that the foliage brings can be a welcome addition to any pergola. Also, pergolas with integrated trellises on one or more sides can also help to give their occupants a little privacy. So when designing your pergola, it’s a great idea to design it as an arbor too! Often pergolas are built off of existing structures such as the house. This can be a great way to provide a little bit of shading for decks and patios that are adjacent to the home. In this case they can perform much like awnings do, and can even help keep your air conditioning bills down by intercepting sunlight that otherwise would be warming the house. Shading is important not only for the direct light from the sun, but also from reflected light. Anyone who’s ever stood on a light concrete patio during the summer can attest to how much heat and light can be radiated from it. By shading the patio itself, you are keeping that radiation from at bay as well. Finally, creating outdoor living spaces where it is comfortable to spend your time can help save energy as well. While you’re out on the deck reading a book, or in the garden enjoying the beauty of nature, you aren’t inside using energy hogging appliances. This means you are saving energy whenever you go out to enjoy your backyard, and a pergola can be one of many good reasons to do so. As far as design implications go, this is one area where the functionality of pergolas can vary wildly. The design decisions such as orientation and placement of the pergola can make a big difference. When attached to the house for instance, the effect is going to be much greater than if it is a free-standing pergola, even when just a few feet away. Orientation matters because of how the shading from the slats above are cast. When a pergola is oriented North and South, the shade from the slats is going to change throughout the day. With vertical slats, it will mean the most light makes it through when the sun is highest in the sky, which is often the exact opposite of what would be preferable. In most cases it would be better to have the most light in the mornings when it’s cool, and then later in the day when things have heated up, the shade increases. This can be accomplished by tilting the top of the slats to the East. Pergolas which make use of this type of design style are often referred to as solar pergolas. With the slats East and West, the pergola will cast the same shade throughout the day. This can be a good option in cases where you just want a steady climate. 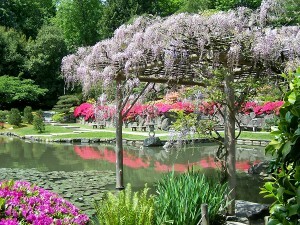 However, as the sun moves higher in the sky during the summer, there will be less shade cast by the pergola. Again, tilting the tops of the runners towards the South (in the Northern Hemisphere) is a good way to modify the amount of light that will pass through. This way in the winter when the sun is lowest in the sky, the most amount of light will make it through. In the summer when the sun is high in the sky, there will be more shade. It’s design concepts like this, that really don’t cost anything yet provide intelligent levels of shading throughout the year, that make solar pergolas such an energy efficient choice. The energy efficiency of a pergola can also be greatly enhanced by using the pergola as a trellis. As the leafy vines grow up over the top of the pergola, their canopy will help to shade the area below, intercepting even more light before it can heat the home. Then during the winter months when you want that heat, the plants will have died back allowing the light to pass through. Designing your pergola so that it can be used as an arbor or trellis is thus a very important consideration. Sometimes pergolas are just intended for a visual feature for the yard. In such cases, going with what looks best makes a lot of sense. However, there are a lot of other implications that can affect how well suited a pergola is for your situation. We’ve already touched on energy efficiency, foot traffic, and material concerns. However, there are a lot of other details that can make or break the usefulness of the pergola if they aren’t considered in the planning. One of these is whether the pergola will be used as more of a shelter during inclement weather. It’s rather simple to include attachment points for a canopy in the pergola’s design. For a more involved method that will still allow the pergola to retain it’s open feel, using glass panels to create a roof could be a good idea. This glass could even be treated to filter out UV rays, making the sunlight that does pass through the structure less damaging to the skin and other materials. Another consideration is if you want to have privacy while relaxing in your pergola. Privacy screens can go a long way towards making an exposed pergola into a comfortable place to rest or play with your family away from prying eyes. This is another case where including a trellis or arbor into the design can be very helpful. Not only will the lattice of the trellis or arbor help give you privacy, but the plants growing on it can make it quite complete. The timing of such privacy is again very fortuitous, as it will be during the warmer times of year that you have the most privacy. This corresponds well to the times of year when you are most likely to want to be out enjoying your yard as well. One other consideration that should be taken into account is whether you will want to have lighting on your pergola. Because there are very few places to hide wiring, this is something you should definitely decide on in the planning phase, so you can build the pergola in a manner in which the wiring will be both safe and unobtrusive. Having lighting on your pergola can help it continue to provide a visual appeal once the sun goes down, as well as to help you enjoy nite time parties and gatherings in your yard. The internet is overflowing with a wealth of pictures and videos. Finding the look that you want from your pergola should definitely start with an online search. By examining photos of pergolas that catch your eye, you can help determine which styles or features that are really what you want for your own design. Pay attention to the small details that you like, and keep a list of things you want your pergola to include. There are a lot of pergola plans available online too. Sometimes these are free, but often you’ll need to pay a few bucks to get access to them. Even if you are going to design and build your own, it can be well worth the investment just to see how a well-built and professionally planned pergola is designed. Once you know what you want from your pergola, it may become evident that the design you are looking for just doesn’t exist yet. While there are huge variety of designs and kits to choose from, they often fall into rather simple and limited categories. If you do want to design your own pergola, you can go a long way by just tweaking another design a little bit. If you aren’t making big changes to the weight or spans involved, you won’t need to adjust the support structure at all. Care needs to be taken if you decide to change materials, since not all materials have the same strength. Even when choosing between different types of wood this can have implications on what type of designs you can safely make. If in doubt, don’t change it or consult with a professional architect or engineer. There are software packages that can help make this design process much simpler. Several lawn and garden designers have templates for pergolas and other yard structures built in which you can modify yourself. Google has a great tool called Google Sketch, which you can use to easily visualize your pergola plans as they take shape. How Will You Build Your Pergola? Whether you choose to go with an existing pergola plan, or design your own, or even just build a prefabricated pergola kit, building it yourself will make for a rewarding and fun addition to your landscaping. DIY also helps to ease the impact on the pocket book. However, a pergola may be the last outdoor structure that you’d want to be learning how to work with wood on. Other buildings, like sheds or gazebos, you can hide some of your mistakes under the roof or walls. With pergolas it’s all going to be out there on display, so make sure you have the skill to do it right. The tools necessary for the build are generally pretty simple. A cross cut saw is a great help for getting the angles right. A table saw can help you straighten out the wood. Some sanding will be necessary to smooth the corners and edges, unless of course you’re working with timber and want that rough finish. A cordless drill will make the build a lot easier. Those are the basics. If you want to do any scroll work on the end of the rafters, a jigsaw comes in real handy. There could also be some concrete work to do on the foundation for the posts, depending on where you want to position the pergola. Often this is a tool-set that the average handyman will have in their garage, it’s nothing special.